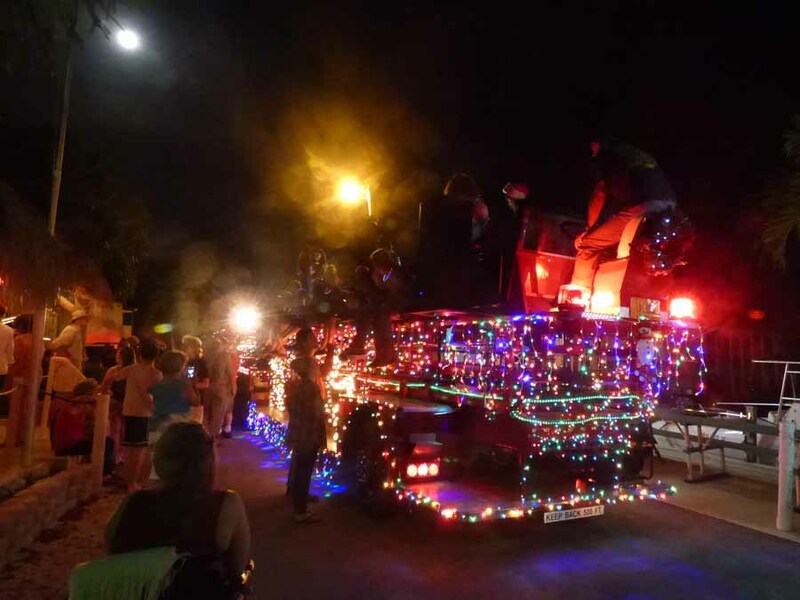 My town, Marathon, Florida, USA has an interesting Christmas tradition that I will share with you. It started in 1970s. Every Christmas Eve the fire department folks and families ride all over town in a ladder truck covered with lights. They play loud Christmas music and toss candy canes to the children. I don’t know if they have a specific route, but it seems they cover most streets. You can hear them coming before they are in sight. Everyone comes out to wave to the people on the firetruck as they pass by. I always have. Our RV park has a Christmas Eve party in the clubhouse and when the firetruck pulls up outside, we all run out to wave to the people riding it. This year Santa climbed down from his chair at the base of the ladder and went into the clubhouse. I think he was posing for pictures with people, but I was outside taking pictures of the truck. It is so big that I had to take three pictures to get it all. Note that the firetruck is a convertible. Santa’s chair was mounted on the base of the ladder. There was a large lighted “Merry Christmas” sign on the front flashing on and off, but it was off when I got this picture. Most of the people were riding on both side of the second section of the firetruck. I hope they had seat belts or were somehow tied down. There was another driver at the back end. The RV park roads are so narrow so it was a good thing that huge truck can bend around corners. Our neighbor and musician, Dave Scott, entertained us with his guitar. Many people got up to sing with him, including myself. 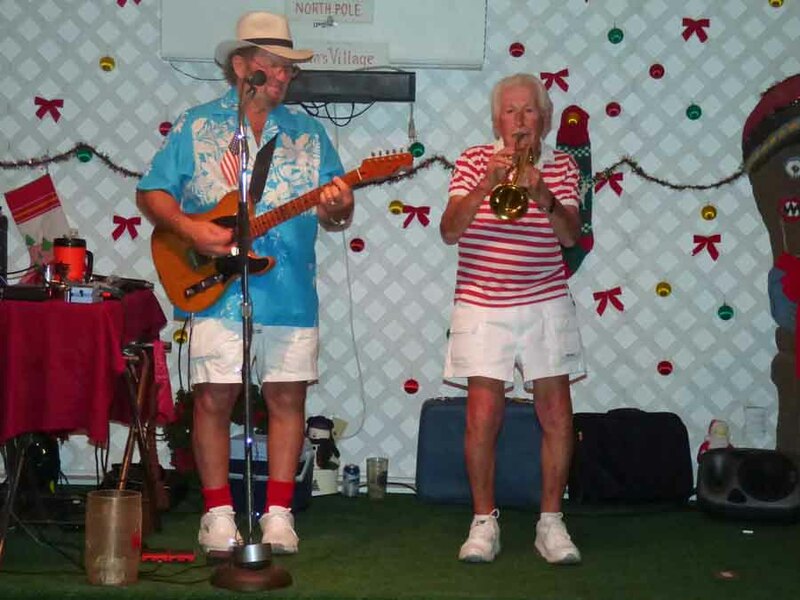 You may remember our 98-year old trumpet player, Micky Belin, who got up and played a few tunes. It was a beautiful night with a full moon. The scattered clouds were lit up by the moon and it was magical. It was so nice that, after we left the party, we walked to the waterfront. The moon was so bright that the horizon was very clear on the ocean. Merry Christmas Lisa. I enjoyed your son’s description of the family get-togethers at Christmas. It all sounds like fun! Have a happy holiday, Dianta! hi Dinata…thanks for this…we enjoyed the truck over here, too…I think there’s a story behind the old fire truck itself but I don’t know any more…will look for more stuff about it…. I did find a magazine article with a little bit, but accidentally closed it and couldnât find it again. Thatâs why I said 1970s rather than the exact year. I think Mike Puto was part of it. Hi Dinata, enjoyed this post very much after “finding” you at the recent “Blog Party.” We had the local volunteer fire company come through our development (and eventually the whole township) with Santa on a truck earlier in the month. I can’t say the dogs in the development liked the truck’s visit so much (with all the noise) but I’m sure they are enjoying the gifts Santa left for them today! Want to wish you, yours and all your readers the very best of Holidays! Nice to hear from you! And, I glad to hear other towns have Santa on a Firetruck. I am also following sportsattitudes, but am not a sports fan so I don’t know how long I’ll last. Dinata, please check your spam folder as a few WordPress users have reported comments winding up in spam somehow. I replied to you and suggested following my non sports site instead. Have a great day! Bruce B.
I didn’t find anything. Tell me again. I was going to suggest you follow lifeattitudes.wordpress.com instead if not a sports fan. That’s my “non-sports” site and it certainly sounds like you would enjoy that more than the sportsattitudes site. In any case…thanks! I never thought about that, but I bet it would be a real thrill ride! A great tradition, that sounds like a lot of fun. I imagine the children think it’s quite magical watching those Firetrucks go past. Thank you for sharing this, Dinata.